An elderly man in a subdued green velvet cloak trimmed in fur instructs a boy wearing a lavish Eastern costume. The artist presents a study in contrasts: the student's youthfulness, his smooth complexion, lavish garments, and quest for knowledge are balanced against the learned man's aged, weathered face as he imparts wisdom. A warm light that accentuates the tonal contrasts and rich textures of the velvet and satin fabrics bathes the two figures. Light catches and shimmers off the precious stones of the boy's gold jewelry. Fine, precise brushstrokes enhance the overall impression of softness. The subjects are presented in the guise of historical personages, possibly portraying the youthful Old Testament prophet Samuel with his instructor Eli. The use of lavish costumes and light and dark contrasts reveal the influence of Rembrandt. Elizabeth, Queen of Bohemia, 1596 - 1662, by bequest to William Craven, 1662. Source: Pennant, Thomas. The Journey from Chester to London (Dublin: Luke White, 1783). William Craven, first earl of Craven, 1608 - 1697 (Combe Abbey, Warwickshire, England; Ashdown Park, Berkshire, England; Hamstead Marshall, Berkshire, England), by inheritance to William Craven, 1697. William Craven, second baron Craven, 1668 - 1711 (Combe Abbey, Warwickshire, England; Ashdown Park, Berkshire, England; Hamstead Marshall, Berkshire, England), by inheritance to William Craven, 1711. William Craven, third baron Craven, 1700 - 1739 (Combe Abbey, Warwickshire, England; Ashdown Park, Berkshire, England; Hamstead Marshall, Berkshire, England), by inheritance to Fulwar Craven, 1739. Fulwar Craven, fourth baron Craven, died 1764 (Combe Abbey, Warwickshire, England; Ashdown Park, Berkshire, England; Hamstead Marshall, Berkshire, England), by inheritance to William Craven, 1764. William Craven, fifth baron Craven, 1705 - 1769 (Combe Abbey, Warwickshire, England; Ashdown Park, Berkshire, England; Hamstead Marshall, Berkshire, England), by inheritance to William Craven, 1769. William Craven, sixth baron Craven, 1738 - 1791 (Combe Abbey, Warwickshire, England; Ashdown Park, Berkshire, England; Hamstead Marshall, Berkshire, England), by inheritance to William Craven, 1791. William Craven, first earl of Craven, 1770 - 1825 (Combe Abbey, Warwickshire, England; Ashdown Park, Berkshire, England; Hamstead Marshall, Berkshire, England), by inheritance to William Craven, 1825. William Craven, second earl of Craven, 1809 - 1866 (Combe Abbey, Warwickshire, England; Ashdown Park, Berkshire, England; Hamstead Marshall, Berkshire, England), by inheritance to George Grimston Craven, 1866. George Grimston Craven, third earl of Craven, 1841 - 1883 (Combe Abbey, Warwickshire, England; Ashdown Park, Berkshire, England; Hamstead Marshall, Berkshire, England), by inheritance to William George Robert Craven, 1883. William George Robert Craven, fourth earl of Craven, 1868 - 1921 (Combe Abbey, Warwickshire, England; Ashdown Park, Berkshire, England; Hamstead Marshall, Berkshire, England), by inheritance to his wife, Cornelia Martin Craven, 1921. Cornelia Martin Craven, countess Craven, 1877 - 1961 (Combe Abbey, Warwickshire, England; Ashdown Park, Berkshire, England; Hamstead Marshall, Berkshire, England), upon her death, held in trust by the Trustee of Cornelia Martin Craven. H. Shickman Gallery (New York, New York), sold to Christian Humann, about 1968. Christian Humann (New York, New York), by inheritance to Edgar Humann, 1982. Edgar Humann (New York, New York), sold to Herman Shickman Gallery, 1984. Pennant, Thomas. The Journey from Chester to London (Dublin: Luke White, 1783), p. 189. The Beauties of England and Wales, or Original Delineations, Topographical, Historical, and Descriptive of Each County. 18 vols. (London: Thomas Maiden, 1814), vol. 15, p. 56. Catalogue of Pictures Chiefly by the Old Masters of the Italian, Spanish and Flemish Schools, exh. cat. (Birmingham: Birmingham Society of the Arts, with Thomas Knott, 1831), p. 18, no. 64. Catalogue of Pictures, Chiefly by the Old Masters of the Italian, Flemish, and Spanish Schools, exh. cat. (Birmingham: Birmingham Society of Arts, with Joseph Webb, 1833), pp. 17-18, no. 134. Catalogue of the Exhibition at the Coventry Mechanics' Institution, exh. cat. (Coventry: 1840), p. 4, no. 33. Catalogue of Pictures by Deceased Masters of the Italian, Spanish, Flemish, and English Schools, exh. cat. (Birmingham: Birmingham Society of the Arts, with Alfred Allen, 1842), p. 10, no. 54. Pictures by Italian, Spanish, Flemish, Dutch, French and English Masters, exh. cat. (London: William Nicol, with The British Institution for Promoting the Fine Arts in the United Kingdom, 1853), p. 9, no. 47. Catalogue of the Art Treasures of the United Kingdom, Collected at Manchester in 1857, exh. cat. (London: Bradbury and Evans, 1857), p. 65, no. 919. Catalogue of Pictures at Combe Abbey, Warwickshire, The Seat of William Earl of Craven (n.p. : 1866), unpaginated, no. 12. Schneider, Hans. Jan Lievens: Sein Leben und sein Werk (Haarlem: De Erven F. Bohn, 1932), p. 32n1. Nicolson, B. "Dutch Pictures at the Royal Academy." Burlington Magazine 95, no. 599 (February 1953), p. 33n200, fig. 4. Gelder, Jan Gerrit van. "Rembrandt and His Circle." Burlington Magazine 95, no. 599 (February 1953), p. 37, fig. 4. Sotheby's, London. An Important Collection of Historical and Family Portraits, Sporting Pictures, and other Paintings. November 27, 1968, p. 41, lot 87. Stamm, Deirdre C., ed. Rembrandt After Three Hundred Years: An Exhibition of Rembrandt and His Followers, exh. cat. (Chicago: The Art Institute of Chicago, 1969), pp. 52-53, no. 37. Fredericksen, Burton B. Catalogue of the Paintings in the J. Paul Getty Museum (Malibu: J. Paul Getty Museum, 1972), p. 77, under no. 95. Jan Lievens: Ein Maler im Schatten Rembrandts, exh. cat. (Braunschweig: Herzog Anton Ulrich-Museum, 1979), p. 91, under no. 28. Bruyn, Josua, et al. A Corpus of Rembrandt Paintings. 5 vols. (The Hague: Martinus Nijhoff Publishers, 1982-2015), vol. 1 (1982), pp. 565-66, under no. C19, ill.
Brown, Christopher. "Jan Lievens in Leiden and London." Burlington Magazine 125, no. 968 (November 1983), pp. 663-71, fig. 2. Fredericksen, Burton B. "Recent Acquisitions of Paintings: The J. Paul Getty Museum." Burlington Magazine 127, no. 985 (April 1985), p. 262, fig. 96. "Acquisitions/1984." The J. Paul Getty Museum Journal 13 (1985), p. 207, no. 131, ill.
Lunsingh Scheurleer, Theodoor Herman, C. Willemijn Fock, and A.J. van Dissel. Het Rapenburg: Geschiedenis van een Leidse gracht. 6 vols. (Leiden: Afdeling Geschiedenis van de Kunstnijverheid Rijksuniversiteit, 1987), vol. 2, p. 205, fig. 19. Fredericksen, Burton B. Masterpieces of Painting in the J. Paul Getty Museum. Rev. ed. (Malibu: J. Paul Getty Museum, 1988), unpaginated, no. 23, ill.
Schulze, Sabine, ed. Leselust: Niederländische Malerei von Rembrandt bis Vermeer, exh. cat. (Frankfurt: Schirn Kunsthalle, 1993), pp. 180-83, no. 24, ill.
Liedtke, Walter. 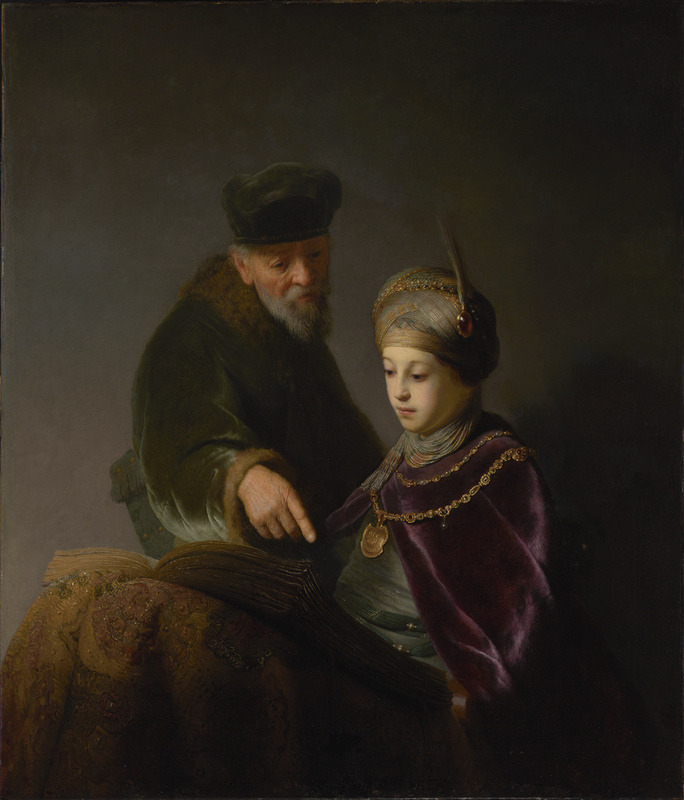 Rembrandt/Not Rembrandt in The Metropolitan Museum of Art: Aspects of Connoisseurship. 2 vols. (New York: Metropolitan Museum of Art, 1995), vol. 2, p. 13, fig. 13. Wurfbain, Maarten. "'The Soothsayer' by Jan Lievens in Berlin: An Attempt at an Interpretation." In Rembrandt, Rubens and the Art of their Time: Recent Perspectives. Roland E. Fleischer and Susan Clare Scott, eds. (University Park: The Pennsylvania State University, 1997), pp. 236, 239, 242n40. Wetering, Ernst van de, and Bernhard Schnackenburg, eds. The Mystery of the Young Rembrandt, exh. cat. (Kassel: Schloss Wilhelmshöhe, with Minerva, 2001), pp. 324-31, no. 66, ill., entry by Ernst van de Wetering. West, Shearer. Portraiture (Oxford: Oxford University Press, 2004), pp. 130, 134-35, no. 83, ill.
Straten, Roelof van. Young Rembrandt: The Leiden Years, 1606-1632 (Leiden: Foleor Publishers, 2005), pp. 206-7, figs. 370, 372. Vogelaar, Christiaan, and Gerbrand Korevaar, eds. Rembrandt's Mother: Myth and Reality, exh. cat. (Leiden: Stedelijk Museum de Lakenhal, with Waanders Publishers, 2005), pp. 17, 19, fig. 8. Heel, Sebastien A. C. Dudock van. De Jonge Rembrandt onder Tijdgenoten: Godsdienst en schilderkunst in Leiden en Amsterdam (Rotterdam: Veenman, 2006), pp. 197-98, 234n167-68, fig. 83. Bomford, David, Jo Kirby, Ashok Roy, et al. Rembrandt (London: National Gallery Company Limited, 2006), pp. 64, 69n16. Wheelock, Arthur K., Jr., et al., eds. Jan Lievens: A Dutch Master Rediscovered, exh. cat. (Washington, D.C.: National Gallery of Art, with Yale University Press, 2008), p. 138-39, under no. 29, ill., entry by Lloyd DeWitt. Thomas, Andrew L. A House Divided: Wittelsbach Confessional Court Cultures in the Holy Roman Empire, c. 1550-1650 (Leiden and Boston: Brill, 2010), pp. 314, 316, fig. 16. Neumeister, Mirjam. Holländische Gemälde im Städel Museum, 1550-1800. 3 vols. (Frankfurt: Städel Museum, 2010), vol. 3, pp. 505-6, under no. 674, fig. 554. Morris, Susan, and Rachel Boyd, eds. British and European Portraiture 1600-1930, exh. cat. (London: Richard Green, 2013), pp. 18-19, under no. 4, fig. 2. Wetering, Ernst van de, and Carin van Nes. A Corpus of Rembrandt Paintings: Rembrandt's Paintings Revisited - A Complete Survey. Murray Pearson, ed. and trans. 6 vols. (Dordrecht: Springer, 1982-2015), vol. 6 (2015), p. 59. Schnackenburg, Bernhard. Jan Lievens: Friend and Rival of the Young Rembrandt, with a Catalogue Raisonné of his Early Leiden Work 1623-1632. Kristin Lohse Belkin, trans. (Petersberg: Michael Imhoff Verlag and the author, 2016), pp. 120-21, 147, ill.
Schnackenburg, Bernhard. Jan Lievens: Freund und Rivale des Jungen Rembrandt, mit einem Kritischen Katalog des Leidener Frühwerks 1623-1632 (Petersberg: Michael Imhoff Verlag and the author, 2016), pp. 120-21, 147, ill.